Mark Twain famously said, "There are three kinds of lies: lies, damned lies, and statistics." I was reminded of the phrase recently when researching how the employers of some family physicians are using data from the Medical Group Management Association's (MGMA's) annual Physician Compensation and Production Survey(www.mgma.com) to create compensation systems that disadvantage family physicians relative to their peers in internal medicine. 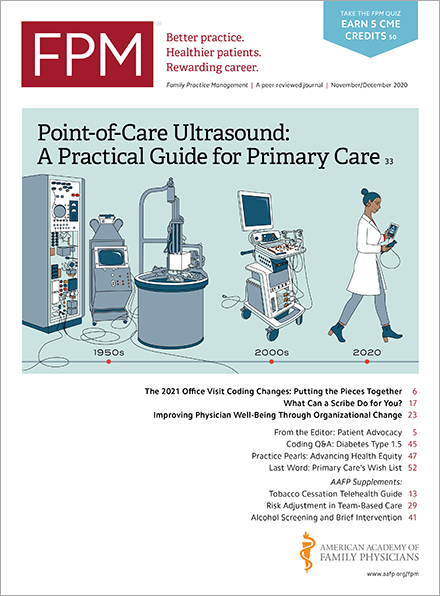 MGMA's data show that the median compensation per work relative value unit (RVU) for family physicians solely in ambulatory care (i.e., no inpatient care) is less than the corresponding figure for internal medicine. In reviewing the survey data and speaking with MGMA staff members, I learned that, in MGMA's experience, the compensation per RVU data is the most misused and misinterpreted piece of information in the annual survey. Further, a summary of MGMA's 2012 report based on 2011 data highlights the disconnect between compensation and production (as measured in work RVUs) as the relationship between the two is not constant. The summary report shows that as family physician compensation increases from one quartile of productivity to another, compensation per RVU decreases, reflecting the fact that productivity (as measured by work RVUs) increases at a greater rate than total compensation across the quartiles. The lower compensation per work RVU for family physicians compared to general internists may simply reflect that family physicians are more productive than their general internist colleagues, relative to their compensation. For example, the median work RVUs for family physicians in ambulatory care in the MGMA data tables were 5,468, while the median for general internists were only 5,233. • Unlike Medicare, many private payers use multiple conversion factors that vary by, among other things, types of service. If general internists provide a mix of services with higher conversion factors than those provided by family physicians – more surgical or procedural services versus evaluation and management services, for example – that could result in a higher compensation per work RVU. • The payer mix may also impact total compensation. For instance, if family physicians treat a higher percentage of Medicaid patients, their compensation may be lower even if they provide exactly the same services (and generate the same work RVUs) as general internists. • Some medical groups are able to negotiate higher compensation rates from private payers than other groups; if general internists disproportionately belong to such groups, they may benefit from higher compensation, even if producing the same number of work RVUs as their family medicine colleagues with less bargaining clout. To its credit, MGMA is clear that the information contained in its report "is presented solely for the purpose of informing readers of ranges of medical practice compensation, charges, and revenue reported by MGMA-ACMPE member and nonmember organizations." They are also explicit that the data "may not be used for the purpose of limiting competition, restraining trade, or reducing or stabilizing salary or benefit levels." Finally, MGMA notes that its "publications are distributed with the understanding that MGMA-ACMPE does not render any legal, accounting, or professional advice that may be construed as specifically applicable to individual situations." In summary, MGMA is simply reporting what its survey respondents told it. The calculated compensation per work RVU is the result of multiple factors, and it is intended to be descriptive, not prescriptive. If an employer of family physicians is using the compensation per work RVU calculations to set compensation levels for family physicians less than other primary care physicians, it would appear to be a misuse and misinterpretation of the data. Or as Mark Twain once put it, "Get your facts first, then you can distort them as you please."